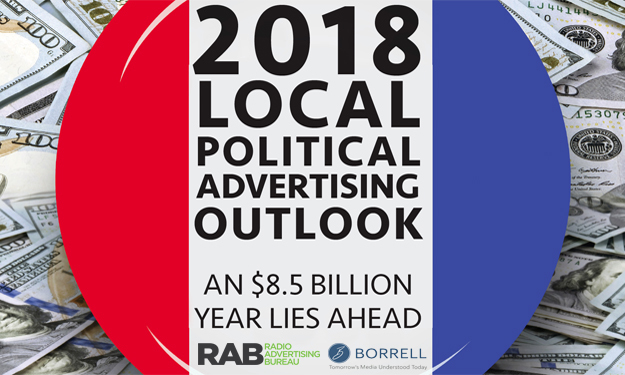 A new report from Borrell Associates, “2018 Political Advertising Outlook,” details this enormous opportunity. The study takes an in-depth look at both 2017 and 2018 political expenditures, offering breakouts of what’s happening to spending with each medium, across all types of statewide and local races. The most interesting piece of new information: More than half of all dollars are coming from special interest groups formed at the state and local levels. U.S. Political Advertising is changing. Spending is being driven upward by revisions in contribution laws and sideways by the dynamic targetability of digital media. Borrell Associates has followed election spending through the years, and they’ve seen an upward spiral to the point at which even the traditionally low “odd” years such as 2017 saw a whopping $4.9 billion spent on candidates and causes. In many ways, 2018 is the year to watch. PAC money is already flowing freely as Republicans, Democrats and various special-interest groups position themselves to make gains that will act as a tuning fork for the next Presidential election. Borrell Associates is forecasting that $8.5 billion will be spent overall. While it’s just 2.5% more than the total spent during the last mid-term Congressional election cycle (2014), that’s because considerably more dollars are flowing into less-expensive digital media and cable spots. As a result, broadcast advertising is suffering, though it still holds the lion’s share of political dollars.